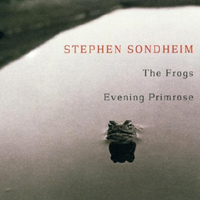 Studio Cast, 2001 (Nonesuch) (5 / 5) Based on a play by Aristophanes, The Frogs was written by Stephen Sondheim and Burt Shevelove to be performed by the Yale Repertory Theatre in the university’s swimming pool. It had a one-week run with an ensemble that included three Yale School of Drama students who would be heard from again: Meryl Streep, Sigourney Weaver, and Christopher Durang. The show harkens back to the Sondheim-Shevelove-Larry Gelbart musical A Funny Thing Happened on the Way to the Forum in that both were freely based on ancient comic classics. This excellent recording of the brief score of The Frogs benefits from the luxury casting of Nathan Lane as the god Dionysos (“an aging juvenile of great charm”) and Brian Stokes Mitchell as his slave, Xanthias. The comic chemistry between these two is terrific, never more so than in the droll “Prologos: Invocation and Instructions to the Audience.” “Please don’t cough / It tends to throw the actors off,” Dionysos begs of the assembled theatergoers, going on to make further requests: “Please refrain / From candy wrapped in cellophane,” and “Please, don’t fart — there’s very little air and this is art.” In the equally funny title song, the chorus alternates between froggy noises and witty self-assessment (“Frogs! / We’re the frogs / The adorable frogs! / Not your hoity-toity intellectuals / Not your hippy-dippy homosexuals”). The only unconvincing moment of this world-premiere recording of the score comes when Shakespeare shows up in the person of Davis Gaines to sing the beautiful ballad “Fear No More” (with a text by the Bard himself, from Cymbeline). Gaines has displayed a powerful baritone in myriad musical theater roles over many years, but here he sounds tired and affected.